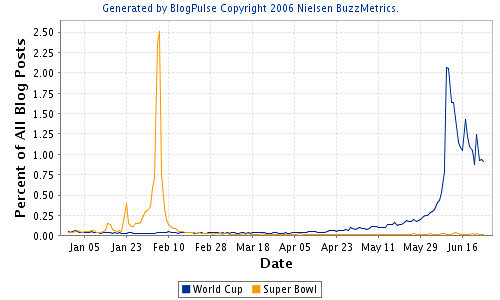 Blog buzz about the World Cup in Germany has decreased since opening weekend and has still not reached the buzz levels of the Super Bowl. On June 9, the World Cup was mentioned in over 2 percent of all blog posts, which is quite impressive. I can imagine that as more teams are knocked out the less interest these countries’ bloggers have in blogging the World Cup. Group B (England, Trinidad and Tobago, England, Sweden and Paraguay) generated the most buzz (39%) during the first part of the World Cup, according to Nielsen BuzzMetrics’ analysis of online forums and blogs. Tags: World Cup, blogs, fotboll, vm.